The Cyvia and Melvyn Wolff Center for Entrepreneurship was recognized recently at the seventh annual Deshpande Symposium for Innovation and Entrepreneurship with the Excellence in Student Engagement in Entrepreneurship Award. Wolff Center for Entrepreneurship Director, Dave Cook (above, center) accepted the award during a ceremony. The Cyvia and Melvyn Wolff Center for Entrepreneurship at the Bauer College of Business is among four institutions in the country recognized this week for entrepreneurship education at the annual Deshpande Symposium Awards. 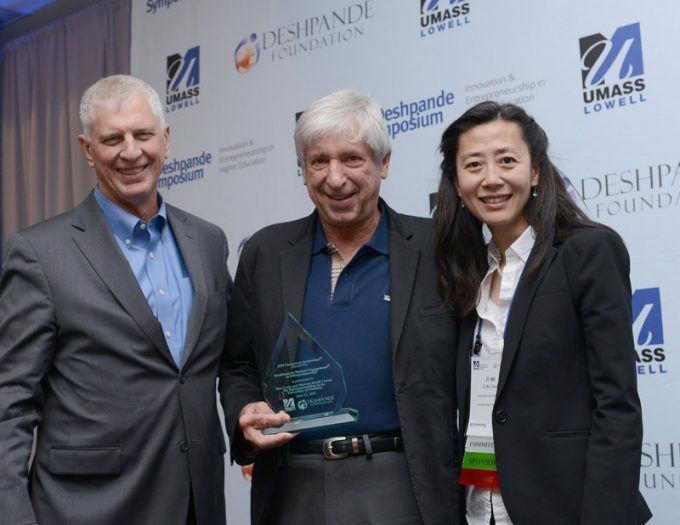 The honors, part of the seventh annual Deshpande Symposium for Innovation and Entrepreneurship at the University of Massachusetts Lowell, celebrate university-level entrepreneurship programs, with Bauer’s Wolff Center earning the Excellence in Student Engagement in Entrepreneurship Award. “This is a recognition of the inspiration, effort & hard work that go into creating a unique experience in educating the next generation of entrepreneurs,” said Dave Cook, director of the Wolff Center. The award recognizes an institution that encourages student leadership and engagement and supports the development of entrepreneurial awareness, skills and practice. The Wolff Center’s entrepreneurship curriculum focuses on experiential learning, Cook said, with more than 30 programs outside the classroom designed to simulate and replicate what’s taught from the textbook. In addition to a lockstep undergraduate program in entrepreneurship comprised of six custom-designed courses, the Wolff Center offers enrichment opportunities for students as well as business plan competition experience and community outreach.